Twelve South has got Mac users backs for years now with brilliant accessories that make everyday experiences even better. Today, we've got our hands on the PlugBug, the latest from Twelve South. If you own a MacBook, chances are that you also have an iPad, iPhone or iPod. And let's face it, all these gadgets are in deep in of their daily dose of tasty electricity. 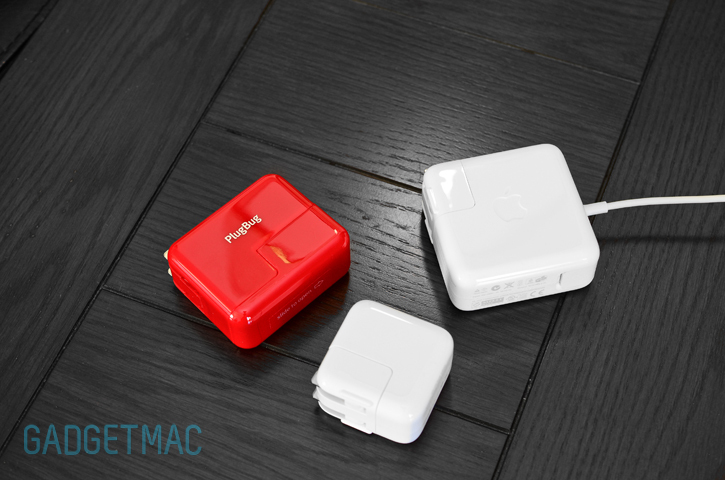 It's shiny red, small and when combined with your Mac's power adapter, the PlugBug adds a 10W USB charging port for your iOS devices to hook up to. Why didn't I think of that? Full review right after the break! With this kind of packaging, we couldn't just pass up on showing that to you. Even though the PlugBug is just a power adapter charger - put simply, Twelve South always wants to make sure any of its products will give you a pleasant first impressions right out of the box. Other than short infographic instructions, all you get is the PlugBug and a thank you. Before the PlugBug is anything else, it's a stand-alone 10W charger specifically geared towards the iPad due to its powerful 2.1amp of USB output that can charge the iPad's massive batteries quicker than if you only used the USB output on your MacBook. The PlugBug feels solidly made and is slightly larger than the iPad's charger and slightly smaller than the MacBook Air's charger. The PlugBug shows its true purpose when you slide off its bottom cover that reveals the "duck head" connection which connects to your MacBook's MagSafe Power Adapter brick and takes the place of the original prong plug. Setup couldn't be more simple and straightforward. I did however, find that sliding the PlugBug on and off on all of my MagSafe Adapters has been a bit difficult in the sense that the fitting is very tight. That's a good thing more than it's a bad thing though. You can now charge two devices at once using only one wall outlet instead of wasting valuable space whilst reducing the clutter and gear you need to carry around with you. That goes for any other USB device that can be charged over USB as well like backup battery packs and Bluetooth headsets. What's fantastic about PlugBug is that it's fully compatible with all MacBook MagSafe Power Adapters. Here's the PlugBug attached to the 15-inch MacBook Pro MagSafe Power Adapter. Granted it doesn't look as great as when it's attached to the smaller MacBook Air MagSafe Power Adapter, but it connects very securely no matter what. It's worth noting that the PlugBug is currently only available in the North American plug type until Twelve South release the international version next year. If I had one knock on the PlugBug it would have to be the fact that for $35, it only sports one USB charging port. In a perfect world, I would have liked to see at least two USB charging ports for the price. Yes the PlugBug does exactly as it was advertised and without a doubt it'll help those with a MacBook and a battery hungry iOS device quickly get up to charge more efficiently faster. Don't be so hard on yourself for not thinking about this yourself. Twelve South's PlugBug is the missing ingredient even Apple never thought about.